Fill a pan with ½ inch water. Boil water. 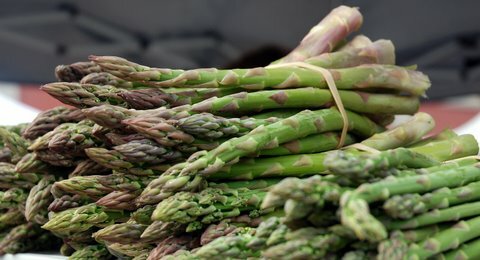 Snap tough ends off asparagus: add to boiling water and cook until tender (3-5 min.). Drain and rinse under cold water. Cut asparagus in thirds, place in bowl; add green onions. Whisk together oil, vinegar, mustard, salt and pepper. Toss 1 tbsp. dressing with asparagus. Wash, pat dry and place spring greens in a bowl. Toss with remaining dressing.